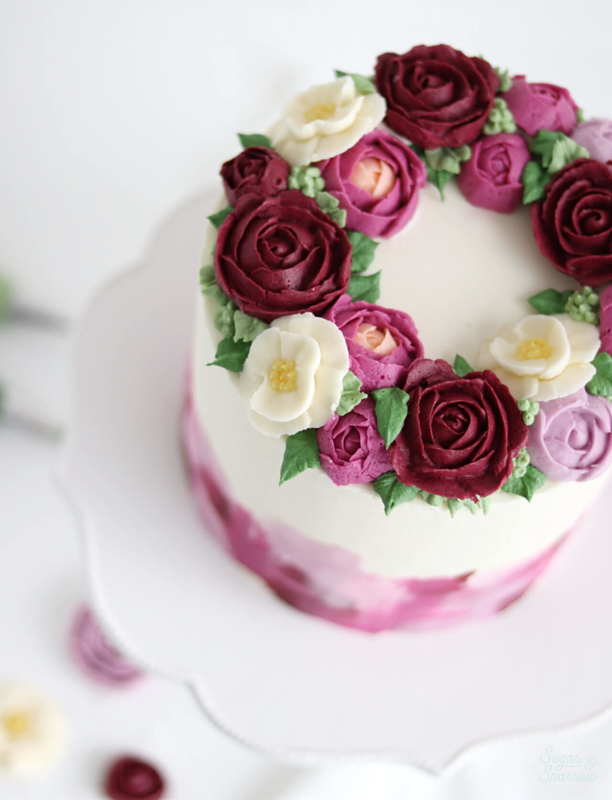 There are three types of buttercream flowers involved in this wreath cake topper: roses, ranunculus, and camellias. Although they may look intricate, they’re easy to make with a little practice and the right materials. 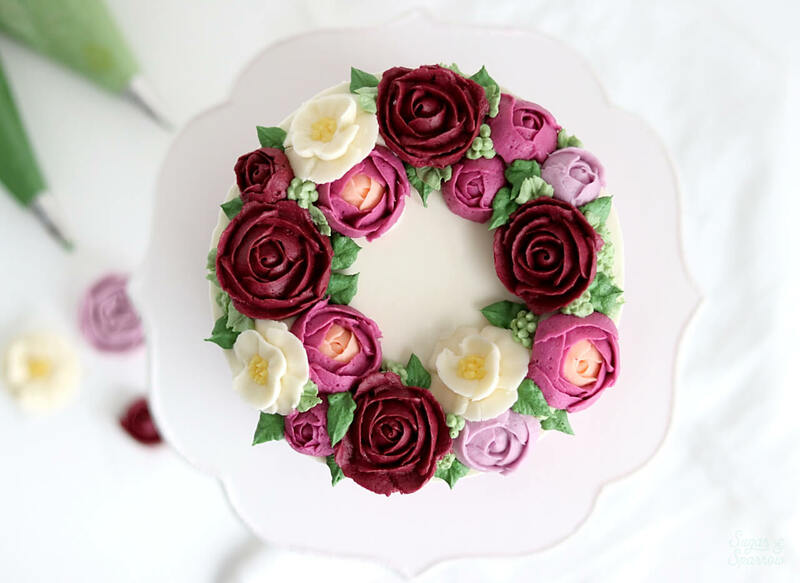 They look so pretty all on their own, but it’s really fun to arrange them into a flower wreath as a cake topper. Total showstopper! 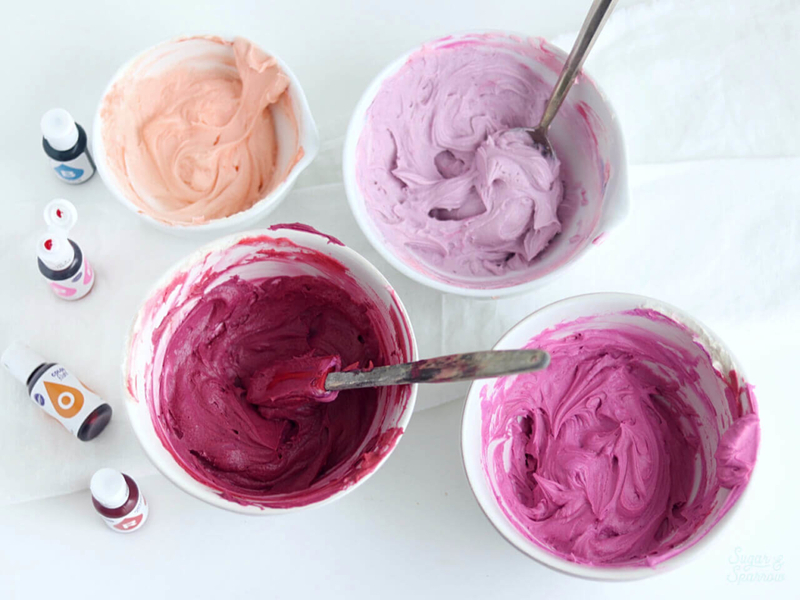 Divide your buttercream into different bowls and mix up the color scheme you’d like your flowers to be. 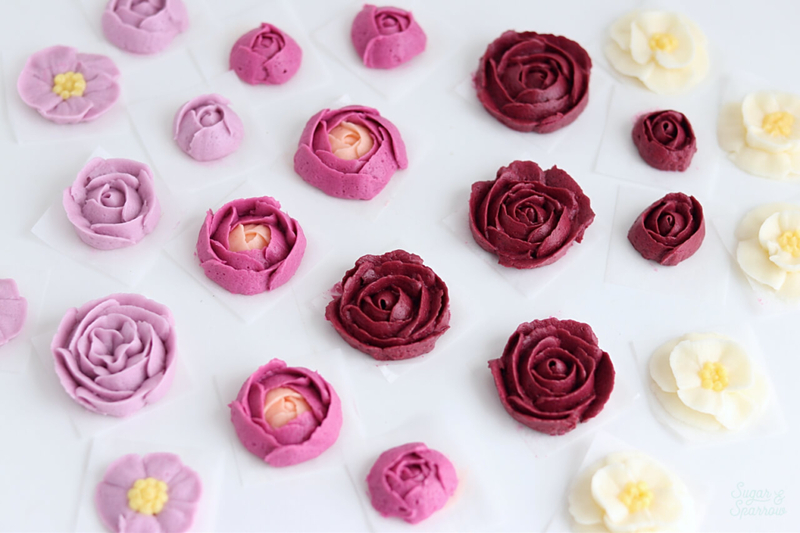 I went with a dark brick red and light purple for the roses, fuschia ranunculus with peach centers, and white camellias with yellow centers, but these buttercream flowers can be made in any color scheme you’d like. You’ll also need a few shades of green for the buttercream leaves, a little yellow for the centers of the camellias, and about ½ cup of plain white buttercream reserved. For all of the shades I created for this cake, I used the Wilton Color Right System from JOANN. It comes with a handy guide for mixing up any shade you could think of! To make the buttercream roses, fit a piping bag with Wilton Tip 104 and fill it with the buttercream color of your choice. Pipe a small dot of frosting on top of the flower nail, holding it in the hand you’re not piping with. Press a parchment paper square on top. With the larger end of Tip 104 touching the flower nail and the skinny end pointed upwards, pipe the center bud as you twirl the flower nail 360 degrees. Pipe petals around the bud as you rotate the flower nail – shorter petals in the beginning and longer petals as you reach the edge of the flower nail. 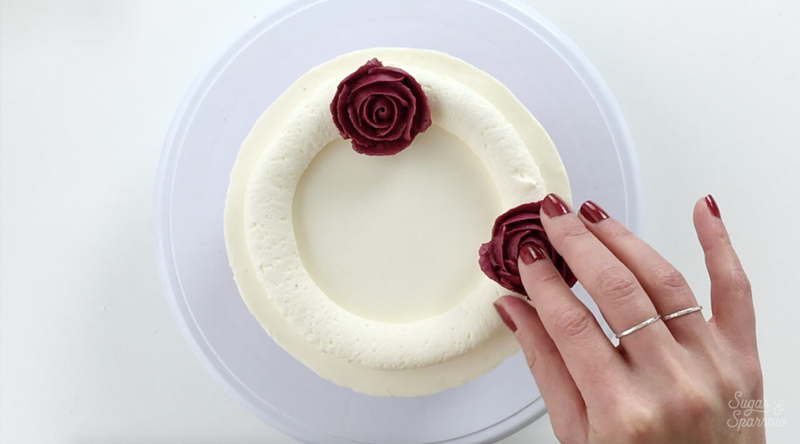 When your buttercream rose is finished, carefully drag the parchment paper square off the flower nail and onto a flat surface. I placed a piece of wax paper onto a baking sheet for this part. Repeat until you have 5-6 buttercream roses, and feel free to pipe smaller sizes for variety. 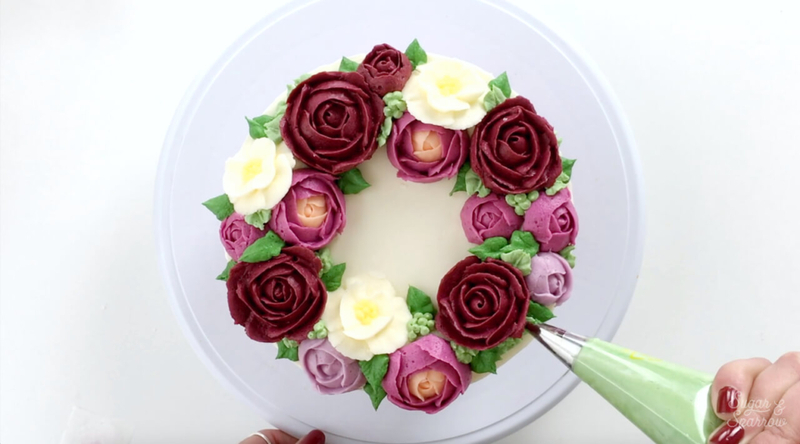 To make the buttercream ranunculus, fit a piping bag with Wilton Tip 104 and fill it with the peach buttercream (or color of your choice for the center of the flower). 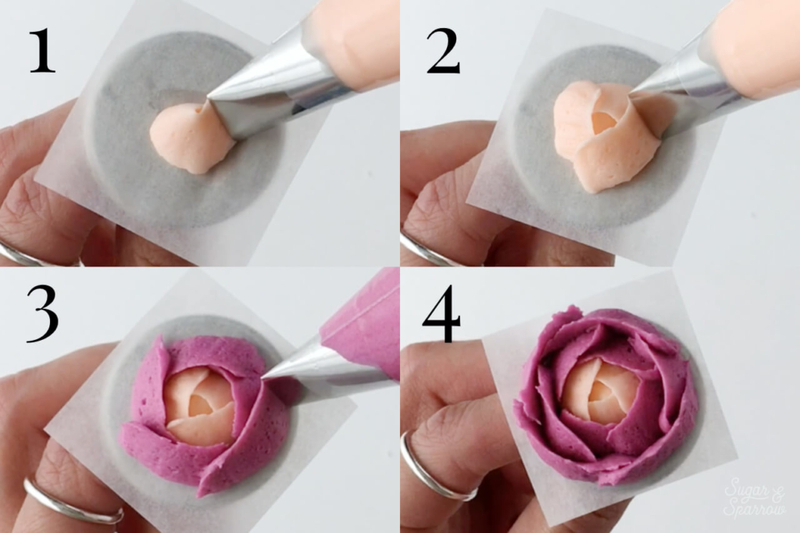 Prepare the flower nail by placing a dot of buttercream on top, then pressing a parchment paper square onto it. Hold Tip 104 at a 45 degree angle, with the larger end of the piping tip touching the flower nail and the skinny end pointed toward the center of the flower nail. Pipe a swirl of buttercream as the base for your center bud as you twirl the flower nail 360 degrees. Then, create overlapping layers of buttercream as you rotate the flower nail. Imagine that you’re piping small rainbows over the center bud as you go around. 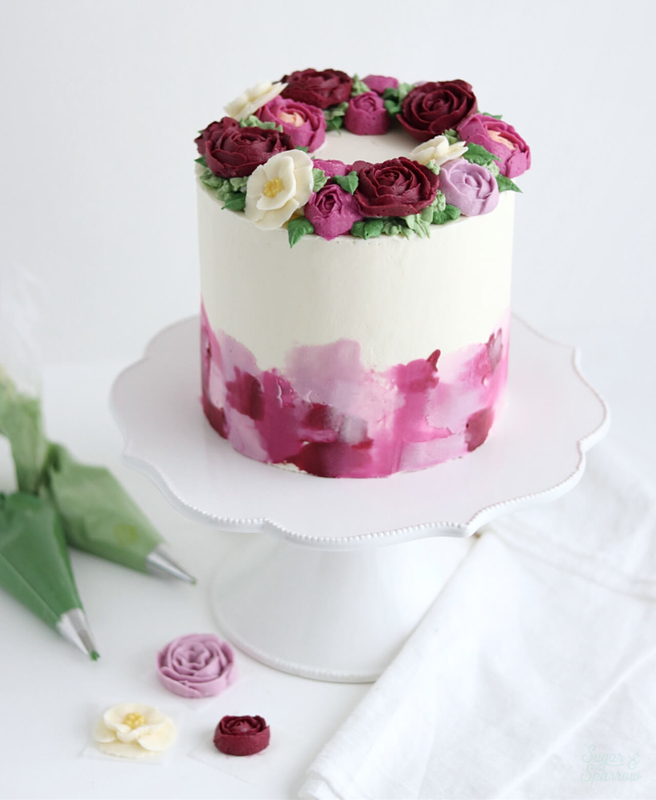 Next, switch to your main ranunculus buttercream color (I used fuschia for this), still using Wilton Tip 104. Continue the overlapping motion for the petals all the way around the bud. When you’re finished, carefully slide the parchment paper onto your baking sheet so the flower can begin to dry. Repeat until you have 5-6 different ranunculus flowers, and remember to create a variety of sizes. 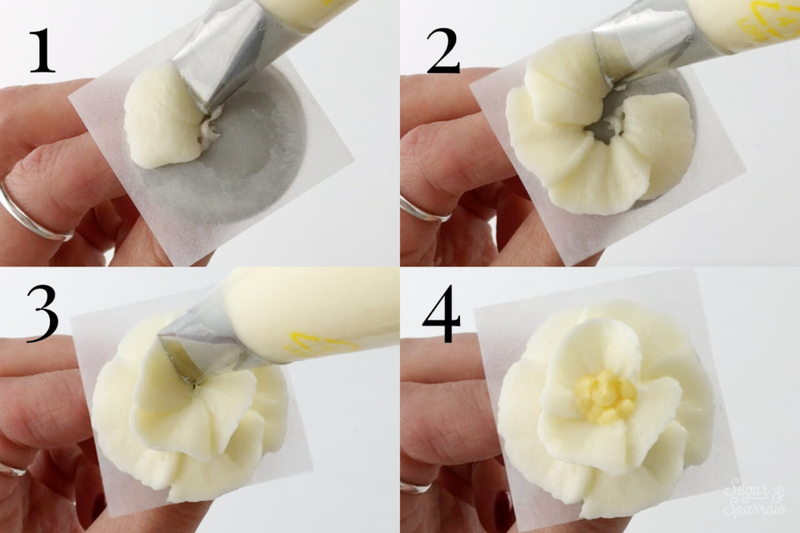 To make the buttercream camellias, place your buttercream into a piping bag fitted with Wilton Tip 104 (I’m using white for these, but you can use any color!). Fit another piping bag with Wilton Tip 3 and fill it with yellow buttercream. The second piping bag will help create the flower centers. 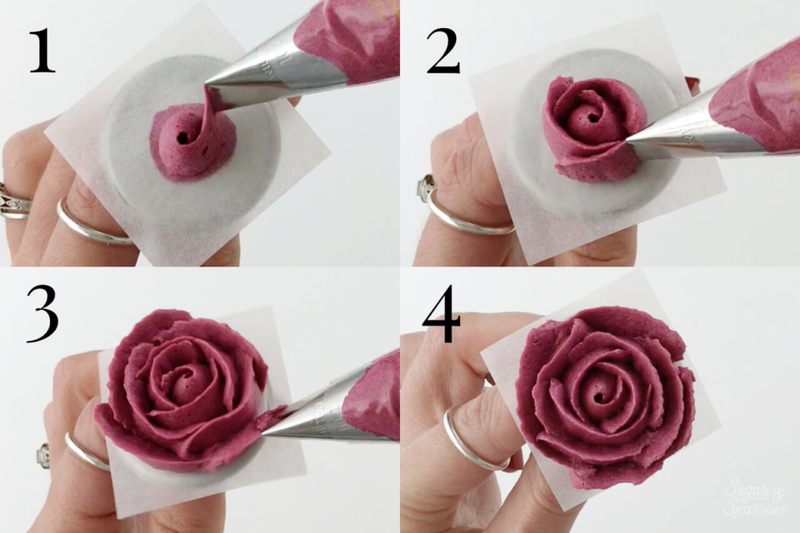 Prepare your flower nail by placing a dot of buttercream on top and pressing a parchment paper square onto it. Starting on the outer edge of the flower nail with Tip 104 flat (the larger end toward the center of the flower nail and the skinny end pointed outwards), pipe a row of petals as you rotate the flower nail. When you’ve created a circle of outer petals, pipe a second row of petals with the same motion, only point the piping tip at a 45 degree angle so the inner row of petals stands up. Then, use your yellow buttercream to fill in the center of the petals with dots. When you’re finished, carefully slide the parchment paper onto your baking sheet so the flower can begin to dry. Repeat until you have about 4-5 camellias. 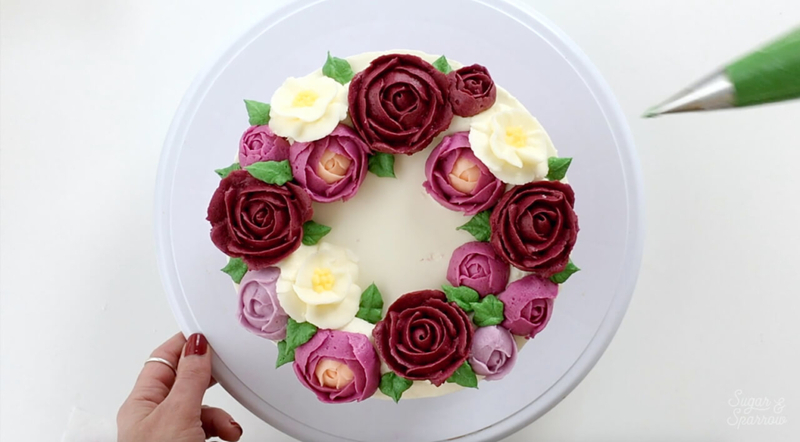 Place your baking sheet with all of your beautiful buttercream flowers into the refrigerator for about 20 minutes to let them firm up before assembling the buttercream flower wreath. After the refrigeration process, they should be firm to the touch and really easy to handle. Although you might be tempted to place them in the freezer to speed this part up, I have not had good luck with the freezer. I know some bakers swear by it, but in my experience, the refrigerator is better when it comes to these delicate buttercream flowers. Prepare a piping bag by filling with your reserved ½ cup of white buttercream and snipping off a 1-inch opening. 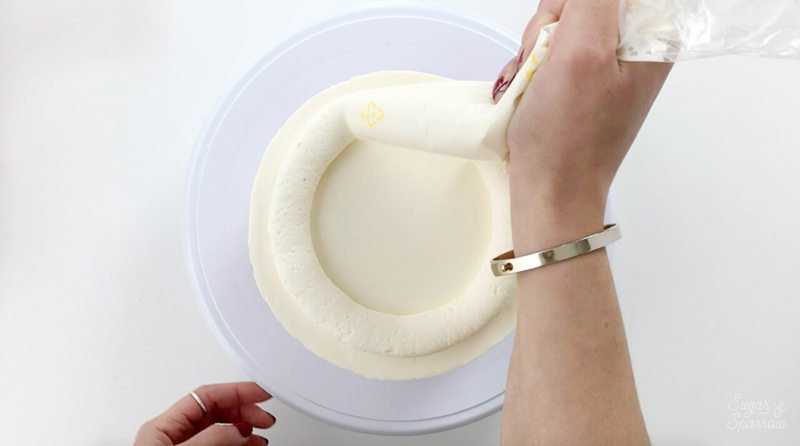 On a cake that’s been frosted and chilled for at least thirty minutes, pipe a circle of white buttercream about ½ inch from the edge of the cake. This will help create height for your flower wreath. 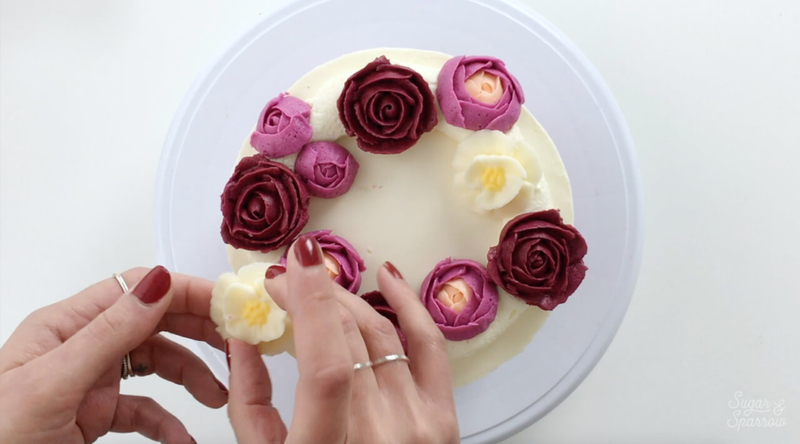 Next, assemble your chilled buttercream flowers on top of the circle of buttercream, pressing them in and angling them outward and inward for variety. Feel free to overlap some of the flowers and don’t worry about small empty spaces – we’ll fill those in next! Fit a piping bag with Wilton Tip 352 and fill it with green buttercream. I ended up fitting another piping bag with Wilton Tip 3 and using the lighter green buttercream to pipe dotted foliage around some of the flowers, but feel free to stick with leaves if that’s your jam. Wherever there’s an empty space (aka the white buttercream is showing through), pipe leaves to fill in the gaps. Feel free to pipe green dots like I did or designs to fill in those empty spaces and complete your floral wreath cake. 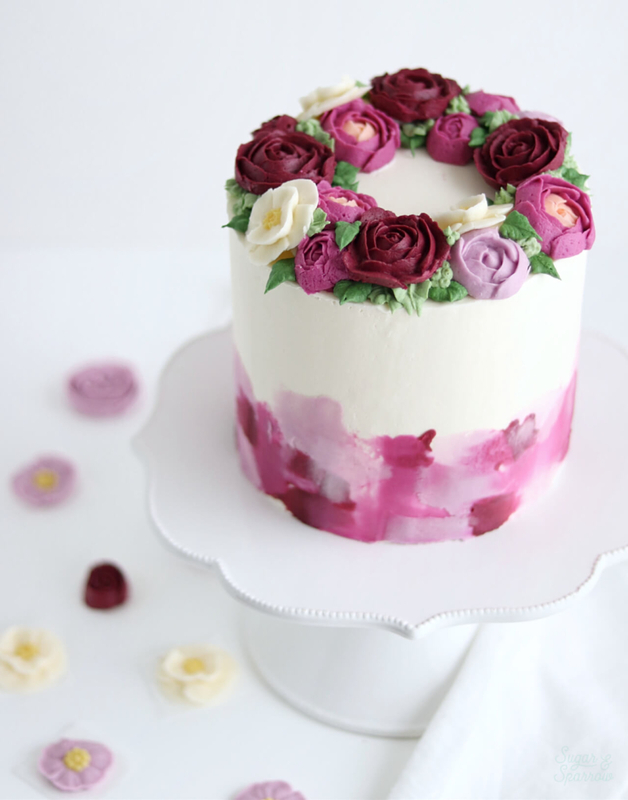 And there you have it – the perfect cake for Spring! Remember that with more practice, your buttercream flowers will be so easy to whip up you’ll want to put them on everything. 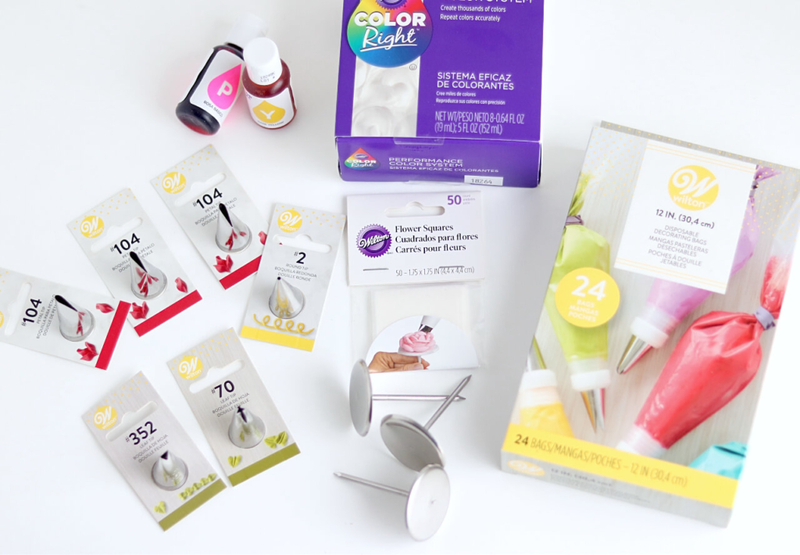 And if you’ve got a JOANN store in your area, be sure to check out their cake decorating supply selection! I’m always so impressed with their collection of Wilton products, cake pans, decorating tools, and all the things. And best of all, they always have great coupons if you download their mobile app. That way you can get what you need and save money while you’re at it! Disclaimer: I was compensated by JOANN for my work of creating this cake, styling, filming, photographing, and writing about their products. As always, all opinions are honest and my own. Thank you for supporting brands that support Sugar & Sparrow.